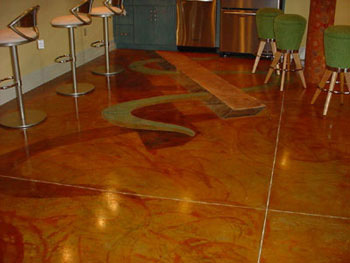 Who Should Use Decorative Concrete? Decorative concrete has become the building material of choice for driveways, patios, pool decks, walkways, interior floors, or countertops due to its durability and almost unlimited design options. Many different colors, textures, or patterns can be incorporated into concrete to have the look and fell of natural stone, slate, brick, tile, or wood. Decorative Concrete is more cost effective and performs better than natural building materials and is also easy to maintain. "Paver" systems are made up of many individual units that will shift out of place with ground movement or freeze thaw cycles. Another benefit of decorative concrete over pavers is grass, weeds, or dirt, will not come up through the joints. To view a detailed downloadable brochure on how Decorative Concrete can work for you please click here. What Style Of Decorative Concrete Should You Choose?